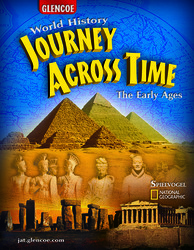 Incorporate classroom-tested reading strategies that give your students the tools they need to become independent learners with this all-new middle school world history program—the perfect combination of story and standards! Help meet the mandates of No Child Left Behind with Reading Social Studies skills embedded in every chapter to improve reading skills and comprehension. Provide structured outline support for students to use before, during, and after reading with the Active Reading Note-Taking Guide. Such support helps students focus on key concepts and information.